The House of Commons is a body without a head. The Members give their opinions in a disorderly manner. At their meetings nothing is heard but cries, shouts, and confusion. I am surprised that my ancestors should ever have permitted such an institution to come into existence. I am a stranger and found it here when I arrived, so that I am obliged to put up with what I cannot get rid of. Beware in making your sporters your councellors, and delight not to keepe ordinarily in your companie comedians or balladines. If you aim at a Scottish presbytery, it agreeth as well with monarchy, as God and the devil. … No bishop, no King! I will make them conform themselves, or else I will harry them out of the land, or else do worse. Herein is not only a great vanity, but a great contempt of God's gifts, that the sweetness of man's breath, being a good gift of God, should be willfully corrupted by this stinking smoke. On Roman Catholics, at the opening of parliament in 1604. James Stuart, the only son of Elizabeth's old nemesis, Mary Queen of Scots and Lord Darnley, long had a bad press among English historians. This was, in part, because he possessed an unconventional personality for a king, especially after the forthright authoritarianism of the Tudors. For example, unlike the last two Henries, he was not a military man: in fact, a military salute on the Isle of Wight once frightened him. Rather, he fancied himself a Rex Pacificus (peaceful king) who would bring peace and concord not only to the three kingdoms, but, as a moderator among his fellow monarchs, to all Europe. In this, he was ahead of his time. He was also a relatively tolerant man, preferring, like Elizabeth, to let Catholics and Puritans live in peace if they maintained their political loyalty to him. His failure to engage in military adventures against the Catholic powers or to enforce the penal laws against Catholics at home would be controversial with his subjects. In fact, his decision to end the war with Spain in 1604 was precisely what the English economy needed, while his flexibility over religion promoted sectarian peace for 20 years. Unfortunately for his image, both then and later, the new king did not look, sound or act, to contemporary eyes and ears, very much like a surrogate for the Supreme Being. It is not James' fault that he was a rather odd-looking man: skinny legs supported an ungainly body, crowned by a somewhat ponderous head. That head housed a tongue that was too large for its mouth, causing a pronounced lisp. The lisp exacerbated a stutter and what to English hearing was a thick Scots accent. In our politically correct age all of this might be overlooked or even celebrated in the name of diversity. But contemporaries used to the regal bearing of the Tudors and bound by their own prejudices could not help but draw unflattering conclusions. In particular, James' Scottish descent was difficult to stomach for English men and women who had long seen their northern neighbors as rude, impoverished brigands. Some charged that the king had swept down from his poor northern kingdom accompanied by "the hungry Scots": Scottish courtiers who saw England as a vast treasure house to plunder. The new king's manner also contrasted sharply with that of his Tudor predecessors, sometimes to his disadvantage. Once again, some of his personal traits were far more damaging then than they would be today. For a king, he could be remarkably informal, even affable. He was not a stickler for ceremony and was good at putting people at ease. This was, in some ways, an advantage, for it meant that, early in the reign, at least, his court was welcoming to men and women of all political and religious persuasions. This openness meant that the king always had a pretty good idea of what various sides in a debate were thinking, while each might hope that their view would prevail. On the other hand, the Tudors' success had stemmed, in part, from their ability to keep people off balance and inspire loyalty, awe, and fear. The new king's personality and reputation worked against these feelings in several ways. For example, there were rumors of excessive drinking, made worse by a poor ability to tolerate its effects. More seriously, and unlike his Tudor predecessors, the new king hated crowds and rarely showed himself to his people outside London. James's foreign policy perhaps met the needs of the age for peace, but often clashed with its temper. When he came to the throne England was still technically at war with Spain. With Cecil's support hostilities were concluded and diplomatic relations renewed. In all the circumstances this may be deemed to have been a wise and prudent step. The main struggle had already shifted from the high seas to Europe. The house of Hapsburg, at the head of the Holy Roman Empire, still dominated the Continent from Vienna. The territories of the Emperor and of his cousin the King of Spain now stretched from Portugal to Poland, and their power was backed by the proselytising fervour of the Jesuits. The Commons and the country remained vehemently hostile to Spain, and viewed with alarm and anxiety the march of the Counter-Reformation. But James was unmoved. He regarded the Dutch as rebels against the Divine Right of Kings. 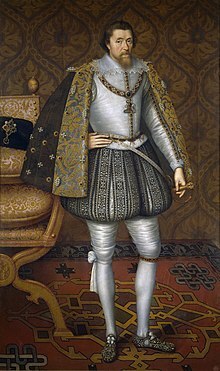 The Spanish Ambassador, Count Gondomar, financed a pro-Spanish party at the new Court; learning nothing from Tudor experience, James proposed not merely an alliance with Spain, but a Spanish match for his son.